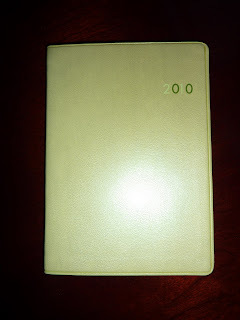 Here is another gorgeous planner generously sent to me by Daycraft, the #1 brand of diaries and notebooks in Hong Kong. 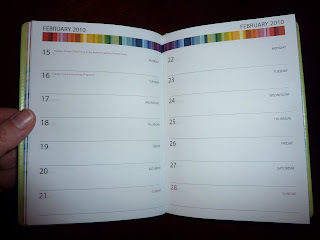 Like all the other Daycraft diaries/ planners I've had the privilege to review here on Plannerisms, the Chromatic Days diary is beautiful, well made, and of the highest quality. My photos unfortunately don't do it justice at all! 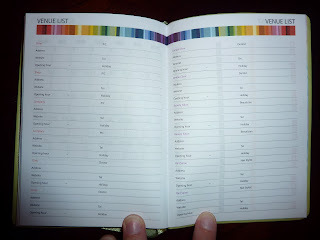 This planner is A6 size, approximately 4 1/2 by 6 inches. 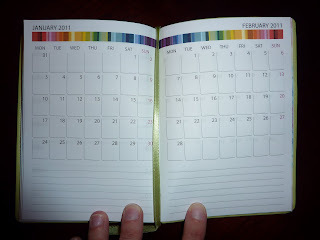 And it is extremely slim, because it has one week per page: The small day spaces are good for people who don't need to write a lot in each day, or as a supplement to your main planner. The weekend days have the same amount of space as the weekdays. 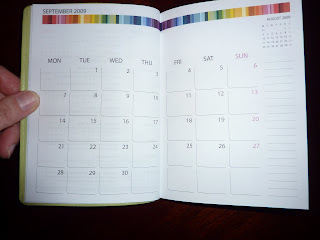 In addition to the weekly pages, the planner has monthly calendars for September 2009-December 2010. As we all know by now, I love monthly calendars in weekly planners! 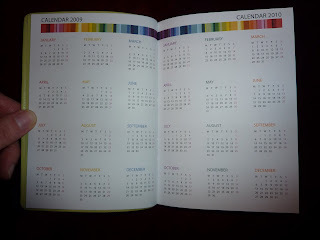 There are also monthly calendars for January-August 2011 for longer-range planning. There is a list of International Holidays for 2010, and a Personal Information page. There is a green ribbon pagemarker that matches the color of the shimmery green cover. The cover is flexible and soft to touch. 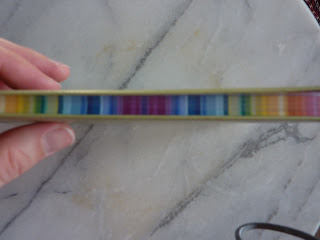 The 70 gsm paper is very white, and every page has the pretty color bands across the top. Daycraft is currently looking for distributors in the US and Europe, and I hope they find them soon because I think these beautiful little books will be very popular!! I'm really glad to have gotten the chance to review them. Sorry, this one will not be given away. At this time I don't have plans for any more giveaways. But, hopefully Daycraft will find a US distributor soon, because these books are definitely worth checking out!